FOR USE IN SCHOOLS AND LIBRARIES ONLY. 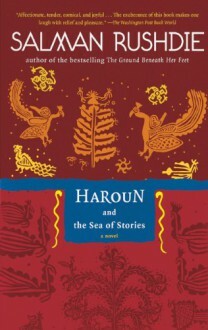 This is the story of Haroun, a 12-year-old boy whose father Rashid is the greatest storyteller in a city so sad that it has forgotten its name. A YA novel that is delightful in and of itself for its story, language play, and relationships. However, knowing that Rushdie wrote it for his son while he was in hiding, and why he was in hiding, adds additional levels to the reader's appreciation. A similarly enjoyable story as The Phantom Tollbooth.